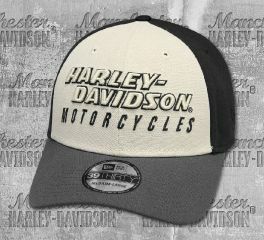 Harley-Davidson® men's baseball caps- helmet hair is not a problem! Own yours, pick from leather, fabric and breathable stretch-fit styles and keep yourself covered. 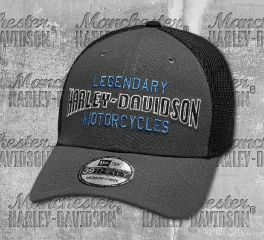 Harley-Davidson® Men's Camo Accent 39THIRTY® Basebal Cap features a dimensional Bar & Shield® logo and reflective appliqué that are really hard to miss. It has also a 39Thirty® visor sticker for authenticity, and stretch fit. 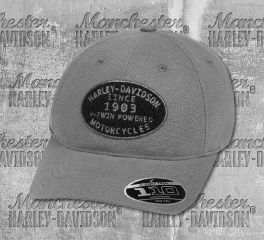 Harley-Davidson® Men's V-Twin Powered Adjustable Cap is made from 97% cotton, 3% polyurethane. It features an embroidered chenille patch on front, and embroidered graphics on back. It has also an Official Flexfit silhouette. Adjustable closure, and interior comfort stretch band. 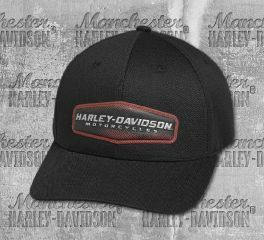 Harley-Davidson® Men's 39THIRTY® Baseball Cap is made from 85% polyester, 15% spandex. It features a dimensional embroidered graphics on front, embroidered graphics on back, and embroidered New Era flag logo on side. It has also an official 39THIRTY silhouette by New Era with visor sticker for authenticity. Stretch fit. 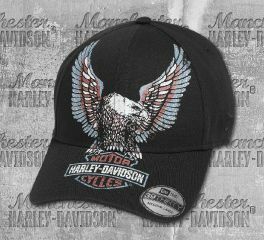 Harley-Davidson® Men's Upright Eagle Patch Baseball Cap is made from 97% cotton, and 3% spandex. It has an official 39THIRTY® silhouette by New Era with visor sticker for authenticity. It features a heavy distressing and fade design, embroidered graphics on front, raw-edge embroidered patch on back, and embroidered New Era flag logo on side. Stretch fit. 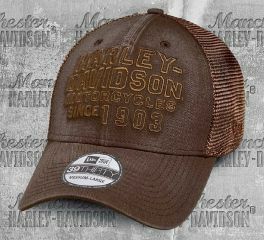 Harley-Davidson® Men's Embroidered Raw-Edge Restored Baseball Cap. 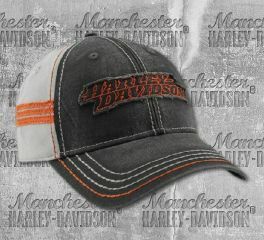 Decked out with a raw-edged embroidered Harley-Davidson® script patch. Constructed from soft 100% cotton, in a heavy black washed color. Comfortable and adjustable velcro closure. Nothing says comfort like a ballcap and jeans! 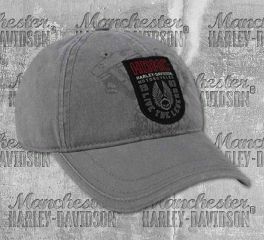 Harley-Davidson® Men's Washed 39THIRTY® Baseball Cap, 97770-19VM. Made from 100% cotton front. Mesh back made from 97% polyester and 3% spandex. Official 39THIRTY® silhouette by New Era with visor sticker for authenticity. Embroidered graphics on front and back. Embroidered New Era flag logo on side. 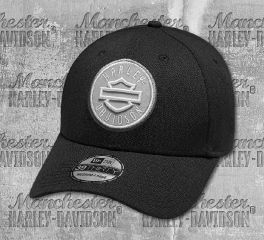 Harley-Davidson® Men's Distressed Denim 59FIFTY® Baseball Cap borrows the faded look and worn feel of a favorite pair of jeans. 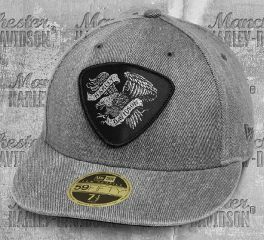 An eagle-and-banner patch proudly marks the front of this men's back cap. Design Details: Official 59FIFTY silhouette by New Era with visor sticker for authenticity. Worn, lived-in look. Contrasting underside of bill. Graphics: Woven patch. Embroidered graphics on back. 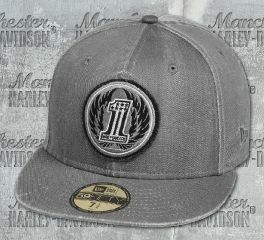 Embroidered New Era flag logo. Take a close-up of the patch on this men's baseball cap. It's not a traditional embroidered or printed style but instead a high-density design for a modern edge. Engineered with the Flexfit comfort band and slide closure, the High Density Print Adjustable Cap delivers all-day comfort. Materials: 98% cotton, 2% polyurethane. Graphics: High-density patch. Embroidered graphics on back. Closure: Official Flexfit silhouette with interior comfort stretch band and adjustable closure. Dimensional embroidery, contrasting panels, and comfy stretch fit—meet the Colorblock 39THIRTY Cap. 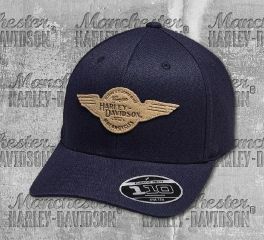 Give this men's baseball cap a shot with jeans and a hoodie at the track, rally, or big game. Design Details: Official 39THIRTY silhouette by New Era with visor sticker for authenticity. Graphics: Dimensional embroidered graphics on front. Embroidered graphics on front and back. Embroidered New Era flag logo on side. 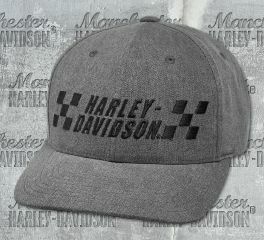 Harley-Davidson® Men's Circle 03 59Fifty® Cap is made from 100% polyester. 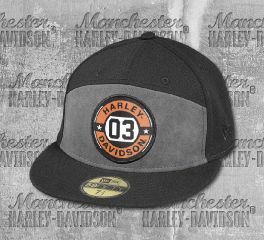 It features an embroidered Harley-Davidson® graphics on front and back, 100% suede panel on front, New Era flag logo on side, and official 59Fifty® silhouette by New Era. It also includes an official 59Fifty® visor sticker for authenticity. Love collecting baseball caps? Well, you might add this one to your collections. 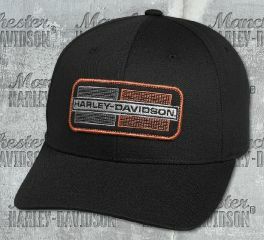 Harley-Davidson® Men's Embroidered Racing Stripe Baseball Cap features an embroidered racing stripe graphics on front. Wear it Loud and Proud! 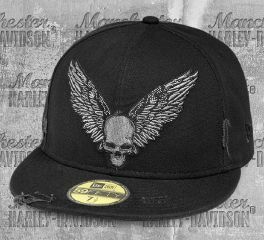 Crafted by the top manufacturer of baseball caps, this Men's Black Race Flag 59FIFTY® Cap makes a bold statement or two. 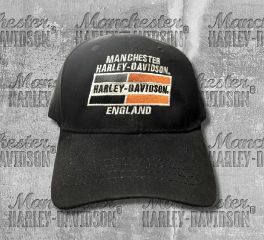 Just as you would expect from Harley-Davidson®.